Who Are Phineas and Ferb and What Exactly Are the Perry Files? Are you sitting down? I have to share something with you that may come across as a bit of a shock. I must shamefully admit that I have never, not once, sat through an entire episode of Phineas and Ferb. That's not to say that I have ever made the effort. Quite frankly, I have only seen glimpses here and there while clicking through all the channels looking for something that isn't... well... a cartoon. All I know is that when I overhear people talking about Phineas and Ferb at work, I often hear rave reviews. So I did a Google search and came across an article on Phineas and Ferb on Wikipedia. It is listed as an animated television comedy-musical series that has received a variety of awards and nominations since it first aired in 2008. Hmm... toe-tapping knee-slapping entertainment à la Disney? 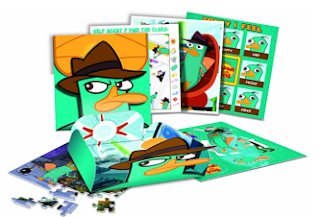 In less than a week, Walt Disney Motion Pictures will release PHINEAS AND FERB: THE PERRY FILES DVD with Digital Copy and Perry Activity Pack. P&F fans are shouting out with glee, I'm sure. I, on the other hand, have no idea what the hype is about but I do find myself intrigued enough to commit myself to watching it. I mean, I make sacrifices like this all the time. Sure, I love spending hours on end folding laundry, vacuuming the floors and scrubbing toilets. Isn't that what every mom lives for? But when it comes to making sure that my children's entertainment is in their best interests, all those fun chores can be indefinitely temporarily placed on hold. 'Cause I'm all kinds of cool like that. Speaking of cool, the disc comes with 154 minutes of featured episodes, a Digital Copy, Bonus Features: Nerves Of Teal and Platybus Tour, AND an activity pack, pictured above. The cost is listed at $24.99 on Amazon.ca, but you can pre-order it for $14.99. Did I forget to mention that I get to give away THREE copies for FREE? My 4 boys, my hubby and I all love watching together! They find it hilarious and so do we with the over the little kids heads jokes thrown in!! My son loves the show because it's funny. I think it's quite well-made. My kids and myself all really enjoy Phineas and Ferb. It is funny and interesting and well animated. We even like reading the books we find at the library. My son loves the show and finds it very humourous! A good time. My son has always liked to watch Phineas and Ferb,,and me as well,,its funny and a great show. That sounds like it could a little annoying. Ha! Because their adventures are funny! We love the show at our house because it is so funny! My children say they like it because it is really funny & entertaining. All three of mine are CrAZy about Phineas & Ferb! I love Candace always failing to bust her brothers! I think its really funny! Great show that's funny to watch! My children? Sure they love it. But I love it more. The jokes are intelligent and FAST, thus my husband usually doesn't get them until 5 min later. We all love P&F because it's funny & well-written. It's a "smart" cartoon. They love it because it is smart & funny!